An owner, developer and builder of student housing is growing in the senior living business in a big way. Charlotte, North Carolina-based Valeo Groupe Americas — an affiliate of global firm Valeo Groupe — already has two communities under construction in Henderson, Nevada, and Bluffton, South Carolina. But that’s just the beginning of the company’s ground-up development plans in the industry, according to Kevin Suite, founding partner, president and COO of Valeo’s senior living arm, Valeo Senior. Starting out, Valeo will focus on markets in the U.S. Southeast and Southwest. But eventually the company wants to become a national presence. Valeo’s communities will be branded under the name “Vineyard” and focus on high-end independent living, assisted living and memory care. The name comes from the concept that the oldest vines in a vineyard produce the best grapes for wine. Suite is a longtime industry veteran who joined Valeo in 2017. Before that, he spent more than 18 years with Kisco Senior Living, wearing a number of hats before ending up as the company’s regional vice president of operations, care services. Using his senior living experience, Suite will help Valeo develop its operational side as the company scales up. And he’s not the only Valeo Groupe leader with significant senior living experience. Valeo was founded by Ted Rollins along with his brother, Michael Rollins. Prior to starting Valeo Groupe, Ted Rollins had started Campus Crest, which ultimately became the second-largest publicly traded student housing platform globally. He also co-founded the Waterstone senior living brand. After leaving Campus Crest and starting Valeo Groupe in 2014, Ted Rollins invested in Watercrest Senior Living, and has since exited that investment. Valeo will focus on ground-up development of communities designed with the latest technology and hospitality trends in mind. The company in January announced a partnership with tech firm K4Connect to incorporate smart-home technology into its communities using K4Community and its recently-announced integration with Amazon Alexa. With their smartphones, a tablet or their voice, future residents will be able to control their lights, monitor their progress in wellness programs and communicate with their loved ones. The technology isn’t only for Valeo’s residents. The company’s staffers will also have access to K4Community’s controls, data and support. Unit counts and services offered will vary upon a market’s needs. The communities will come with hospitality-forward amenities such as multiple dining venues and flexible common spaces that can suit many purposes. “The hospitality piece is really what’s most important, and the care has to follow,” Suite said. As for where these new communities might open, Suite said Valeo will likely focus on markets where it already has a student housing property — and even perhaps marry the two property types together in some way. Already, Valeo is looking at a few opportunities on university campuses. And, the company figures it might be able to hit two birds with one stone when it comes to sales. Valeo Groupe is not the only company that foresees greater integration between student housing and senior living. 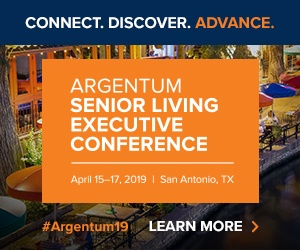 Patricia Will, CEO of Houston-based senior living provider Belmont Village, recently told Senior Housing News that she also expects greater co-location of student and senior housing, perhaps — eventually — even under a single roof.